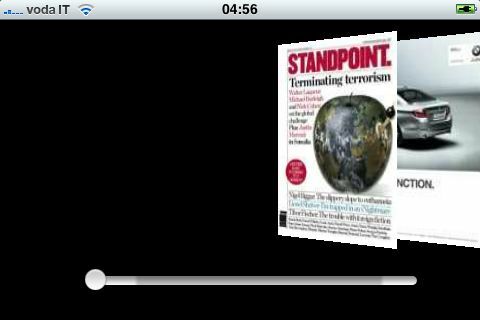 A free app for the magazine Standpoint is now in the iTunes app store. 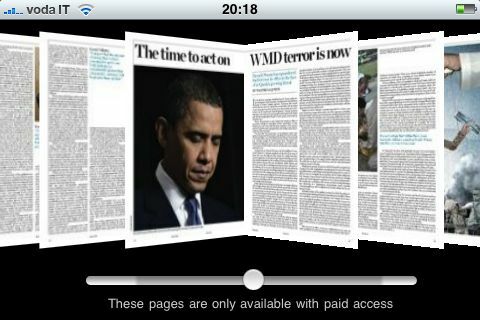 The free app provides access to a portion of each new issue of the magazine as it is published. The rest of the magazine’s current issue is searchable and viewable via thumbnail. With Apple’s in-app purchasing, the user can, at any time, upgrade to a 30-day subscription (for £1.79). Paid subscribers also get access to the archived back-issues, whereas the free app only has a sliver of content from the current issue. When the next issue appears the previous sliver will drop out of the app. The app in its free and premium modes supports syncing (of the current issue within a wifi zone). We think this freemium deal is giving a very solid and generous service to the free app’s users. How generous? 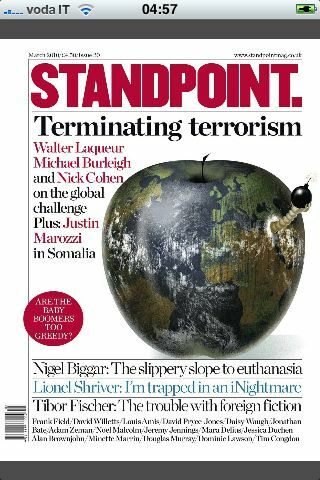 This issue of Standpoint has 11 pages at the front and 7 at the back fully open, and these same pages are also open in the web service (open for a few weeks while the issue is current). 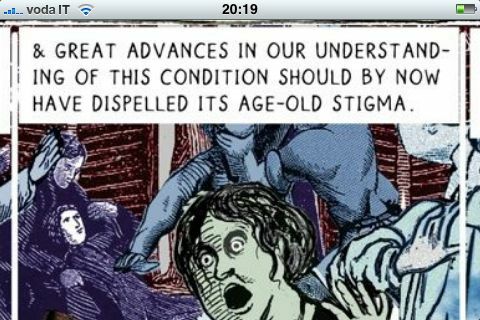 The publisher decides how much of the content to make freely available, perhaps changing the parameters issue by issue. This is the first magazine to be using Exact Editions’ recommended freemium model for apps. Potential readers can pick up the app for free and will then get a generous sample of the magazine on their iPhone whenever a new issue appears. We expect magazine publishers will like this, because it is a way of using the app store as a magazine kiosk that encourages potential customers to browse through free parts of the magazine. As Daryl Rayner (Exact Editions founder and MD) says “Apple’s app store is the best thing to happen to magazines since the invention of the kiosk“. Should the user inadvertently let her paid subscription lapse, the free app will continue to offer access to a few pages of each new issue as it is published, providing a gentle reminder of the availability of the magazine. 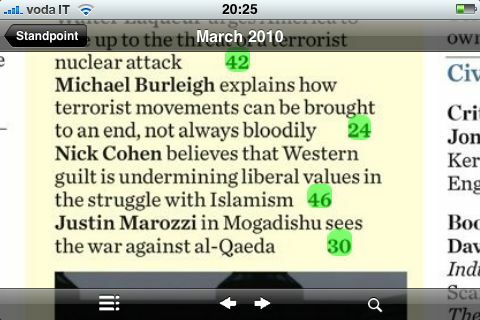 Live links in the Table of Contents. Note the app gives navigation clues from the bars at top and bottom of the frame (bottom: icons for ‘ToC’, ‘Previous’,’Next’, and ‘Search’.